Website and processes: 27 Jan 16 el, 4/5 Good "easy to se but process for checking availability dates not very efficient "
On arrival you will receive a pre-flight briefing with your instructor. Your instructor will go over all aspects of the flight and answer any questions that you may have. 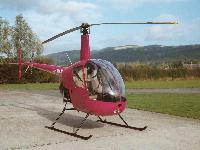 When this is completed you will take to the skies in a Robinson R22. Once airborne you will be invited to take the controls and experience for yourself the pleasure of flying this popular machine. The combination of piloting a helicopter and the spectacular scenery make this a great experience day which you will never forget.